Cinnamic acid is an odorless white crystalline acid that has only been recently studied for its potential in cancer prevention. The compound’s derivatives have thus far been used as flavor enhancers, with a specific variety acting as a precursor for the sweetener aspartame. Despite aspartame’s negative health effects on the body, cinnamic acid is in itself quite healthy. The acid can exist as both trans and cis isomers; however it is the cis form that most people use today as it can be easily derived from a chemical reaction between benzaldehyde and acetic anhydride. The process in which this type of cinnamic acid is synthesized ensures that the compound is removed from all its impurities. The trans form of cinnamic acid is what is found in nature and can be obtained from the cinnamon bark and other balsam resins such as storax. Either variety is generally used for the manufacture of dyes, flavors, and certain pharmaceuticals. Until recently, cinnamic acid was used in the production of methyl, ethyl, and benzyl esters which are crucial aspects in the making of perfumes. Cinnamic acid has not been known to have any medicinal benefit until recently. There was a study made in 1995 that concluded the compound’s potential in cancer intervention. Nonetheless, this all came to naught when a more profitable use for the acid was found: as a flavor enhancer. This continued until 2014 when scientists began re-exploring the possibility that cinnamic acid may slow down and lessen tumor growth. Research into this area, though, is limited and nothing can be conclusively stated regarding this supposed effect. A more recent botanical review noted that cinnamic acid may help pre-diabetic and diabetic patients. When infected mice were fed food loaded with cinnamic acid, researchers saw that their insulin levels were better managed. Another study which used mice models saw that cinnamic acid improved glucose tolerance by promoting insulin secretion. 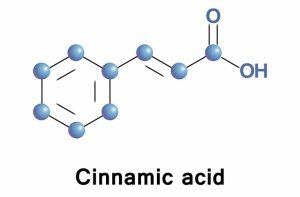 All the same, there are difficulties in prescribing cinnamic acid as a preventive agent since the compound — whether as a trans or cis isomer — needs to be obtained through various means. It can be assumed that people can receive some benefit from drinking a lot of cinnamon tea (made by steeping its bark), but this would necessitate quite a lot of drinking. Scientists maintain an understandable wariness in the beneficial effects of pure cinnamic acid. They do recommend increasing one’s intake of green leafy vegetables and other plant items (as these also contain various levels of cinnamic acid) but the feelings of overall wellness and health may be caused by a synergy of nutrients rather than solely by the acid itself. The lack of data on cinnamic acid makes identifying the body systems that it supports difficult. In broad strokes, cinnamic acid helps the gastrointestinal system as it — allegedly — helps balance insulin levels. This makes it a potential candidate in diabetes management. Due to its touted benefit on cancer prevention, it can be hypothesized that cinnamic acid supports the immune system as well. Turmeric vs Curcumin: What’s the Difference and Which is Better? Cinnamic acid is a derived compound that has been used as a flavor enhancer or as a crucial component in perfumes. Its uses for medicine have only been studied recently. Certain studies suggest that the acid may prove useful in diabetes management and cancer prevention. Further research into this area is necessary.